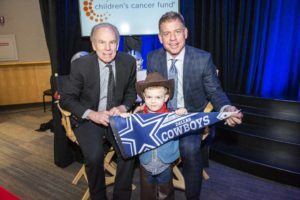 Co-Chairs Roger Staubach (left) and Troy Aikman with Lochwood resident Eli Patterson. Eli Patterson, 5, of Lochwood, is a featured model in the Children’s Cancer Fund Gala “An Evening in the Garden,” where hope blooms in an enchanted garden filled with miraculous stories of survival, on Friday, April 26 at the Hilton Anatole Dallas. In September of 2016, just two weeks shy of his third birthday, Eli Patterson was diagnosed with B-Cell Acute Lymphoblastic Leukemia, a type of cancer of the blood and bone marrow. He was immediately admitted to Children’s Medical Center to begin treatment, which will continue until May 2020. Honorary Co-Chairs Roger Staubach and Troy Aikman will kick off the evening. For more information, call 972-664-1450 or visit ChildrensCancerFund.com.